26 February 2016, at 12:00a.m. US - The centennial theme unveiled by Cobb-Vantress at the IPPE in Atlanta, Georgia, last month will be carried forward around the world throughout the year – with emphasis on the importance of relationships in the company’s success. 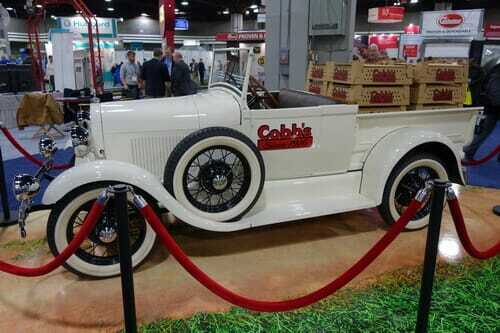 At the show a new trade booth was unveiled along with a restored 1929 Ford Model A chick truck, a replica of the vehicle that delivered Cobb chicks to customers in Alabama during the late 1940s and 1950s. One of Cobb’s truck drivers in Kentucky, Max Worley, himself a keen vintage car enthusiast, was commissioned to make an authentic replica of the vehicle that featured prominently in promotions for ‘Cobb’s Pedigreed Chicks’ as the company was known at the time. The celebrations will continue up to the Eurotier Show in Hannover, Germany, from November 15 to 18 – a few days ahead of the anniversary date of November 20 when Robert C Cobb Sr purchased Old Pickard Farm in Littleton, Massachusetts, which was to become the home of the Cobb breed for more than 70 years before the move south to the current headquarters in Arkansas.